At the meeting on August 4th MX0SKR was on the air. Adam (M6OLT) put up a fibreglass pole and G5RV antenna and using Andrew’s (M0NRD) Yaesu FT-857D a modest laptop with a simple homemade datamode interface members were given the opportunity to try out the new FT8 datamode as well as operate SSB. Band conditions were yet again poor for voice contacts so it was a clear demonstration of the effectiveness of datamodes with weak signals in noisy conditions. 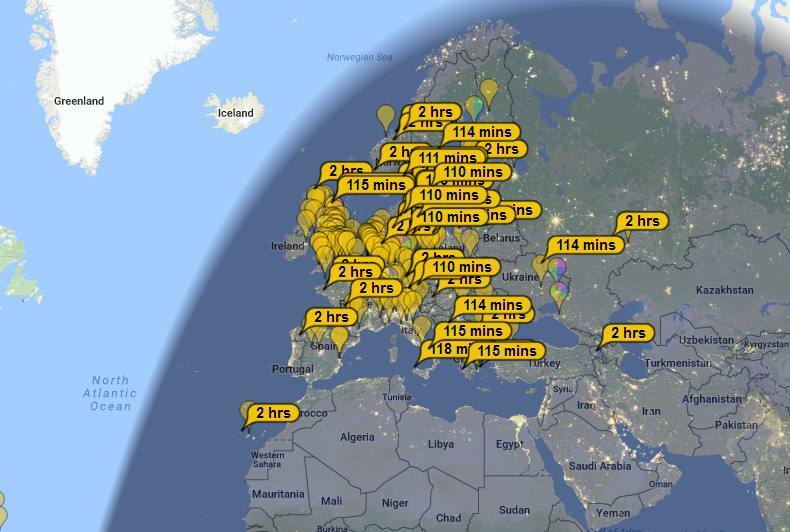 So much so that many members have been investigating the FT8 and other modes available and experimenting with low power levels. The map below (from PSKReporter) shows where MX0SKR was received during the short time we operated. Darren, Richard, Adam and others have all been spotted on the bands and recently licensed Steve (M6TTZ) has been using his QRP Yaesu FT-817ND with a less than ideal setup due to requirements for unobtrusive, stealthy antenna but has made contacts far and wide. The software demonstrated was the new beta release of WSJT-X (version 1.8.0-rc1) which as well as supporting the JT65, JT9 and WSPR includes the new FT8 mode, featuring a faster turnaround. FT8 is slightly less sensitive but contacts are 4 times faster than JT65 or JT9. An auto-sequencing feature offers the option to respond automatically to the first decoded reply to your CQ and auto complete the contact. The beta WSJT-X also offers a new mode for accurate frequency calibration of your radio, improved CAT radio control, and enhanced JT65. While CW (Morse code) may be the original datamode (something many of use are looking to master) the fusion of radio and computers and the ability to extract signals from deep within the noise are maintaining the relevance of amateur radio and experimentation. Anyone interested in keeping abreast of new technologies and experiments with amateur radio then look no further than SKARS so come along to a meeting.